Excellent transition combining stability with speed. Hyper-aggressive looks that match performance. G3 forefoot outsole provides additional wet traction capability. A true high performance shoe for those needing medial support. Also suitable as a daily shoe for more neutral runners. Will also get you noticed at races. Over pronators who want a tempo or race day shoe. 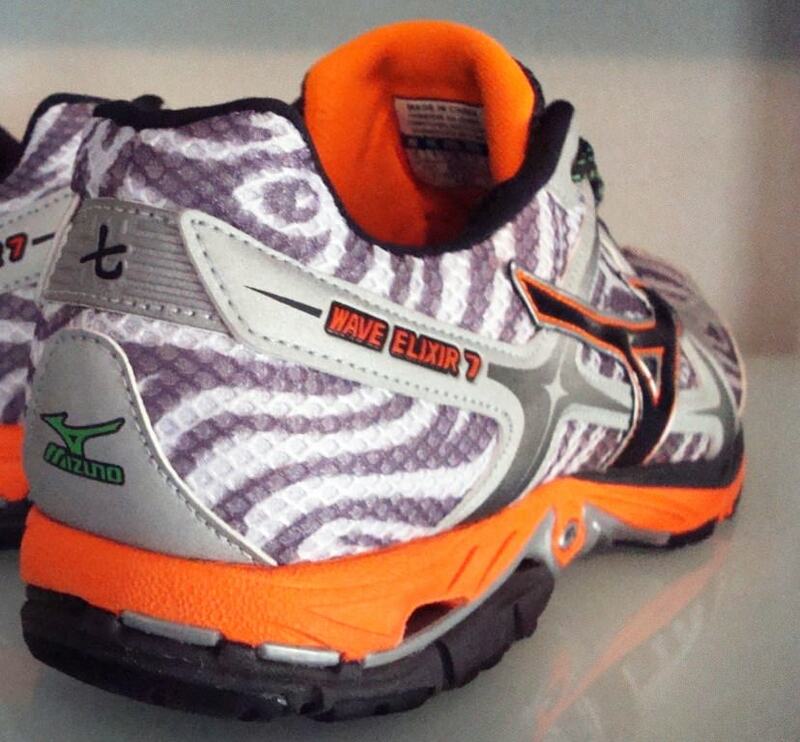 Those needing only mild support could use the Wave Elixir 7 as a daily trainer. In my recent Wave Nirvana 8 and Wave Inspire 8 reviews my biggest gripe was the look of the shoes. It’s a small thing to complain about, I know. Mizuno may be a bit conservative when it comes to the standard colors for the Inspire and Nirvana series but they unleashed the designers for the Wave Elixir 7. What they came up with, visually speaking, is as striking a shoe as I’ve ever seen. Road hazard orange, lime green, silver and black all topped off with a tiger striped mesh! My first real test of the Wave Elixir 7 was at a local 15K. I knew that this test was gonna hurt. The good kind of hurt. 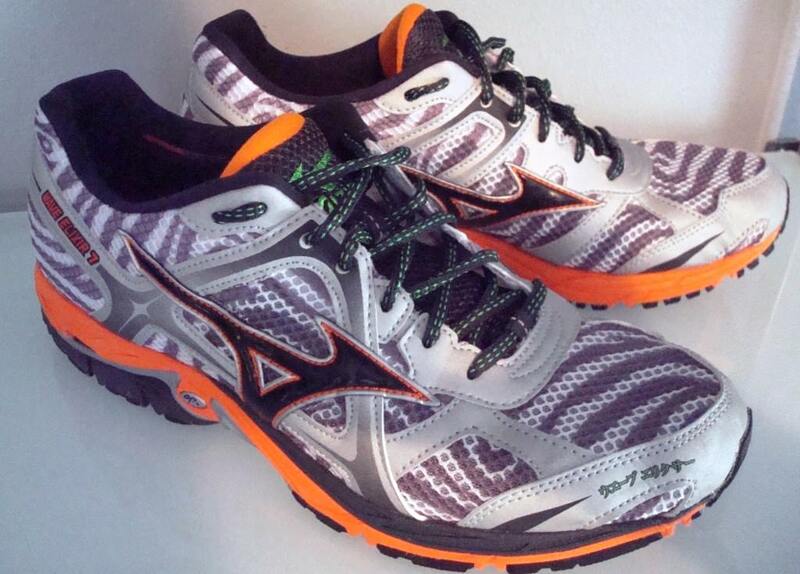 Mizuno redesigned the entire blueprint of the Wave Elixir 7. Everything here is a fresh take and the upper aesthetic is absolutely insane. Mizuno still uses a lightweight, highly breathable mesh but this time it is sublimated with an animal style print straight out of 1987. The overlays are now made from a lighter, more flexible material and are strategically placed to better form the shoe around the arch and heel while leaving the toe box a bit freer. The Dynamotion lateral lace tab is removed and the heel collar has been lowered. The Wave Elixir 7 gets some updated shoestrings as well. The new laces are rendered in lime green and black and sport a lighter but stiffer feel from the laces in the Wave Elixir 6. Also, for the first time, the Wave Elixir 7 gets a cushy Ortholite sock liner which replaces the older style AP foam sock liner. Not to be outdone by the upper, the Wave Elixir 7 midsole has been refined to deliver the performance to match the attitude of the upper. All Mizuno running shoes are designed around the Mizuno Wave Plate. This unique construction situates a plastic plate in the midsole of the shoe and can be tuned to match different runners needs. The Wave Elixir 7 plate moves the arch a bit farther back towards the heel than in previous editions and this results in a slight increase in stability while still allowing enough inward roll to provide a quick transition from strike to toe off. For the first time, Mizuno has introduced their Flex Controller technology to the Elixir series. Flex Controllers are placed at the forefoot flex point and, according to Mizuno, provide for the optimal degree of forefoot flexion. 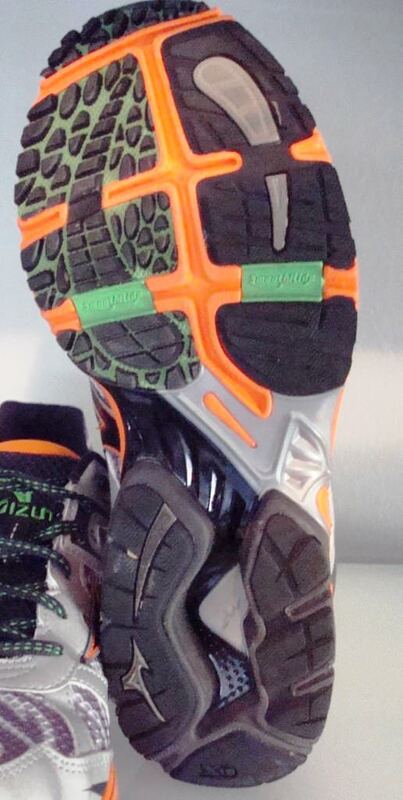 Mizuno’s G3 wet traction outsole is still in place in the medial forefoot area of the Wave Elixir 7. X10 carbon rubber still ensures durability in the heel and Mizuno’s AP+ midsole formulation provides the bounce. Years ago I was fitted for a Mizuno Wave Maverick as my first true running shoe. The Maverick has since morphed into the Elixir series and I always have at least one pair on hand. As my mileage increased I eventually moved on up to the Nirvana series but I have always had a soft spot for the Elixir. It doesn’t hurt that the Elixir is always ready to run fast either. The Wave Elixir 7 is certainly no disappointment in either the looks or performance category. I ran the Elixir once on a treadmill and then took it to a 15K. I ran a new personal best that day and finished pretty well against some of the strongest runners in my town. The shoe never gave me any problems at that race or in any subsequent runs. The arch is solid and the transition is classic Mizuno; fast and with no loss of power through foot strike. It’s an ideal shoe for those of us who need support but also desire a lighter, faster shoe we can take to a race. I even know a neutral footed runner who uses it as her daily trainer. However, I have noticed that the Wave Elixir 7 fit is slightly narrower than before and the toe box is not quite as wide. I had no issues with this but do be aware if you have a higher volume foot. Mizuno has brought the heat with this shoe, literally. The Wave Elixir 7 stands ready to eat asphalt and will relentlessly beg you to up the pace. Pain, sweet pain. We thank the nice people at Mizuno for sending us a pair of Elixir 7 to test. This did not influence our review of the shoe, written after logging a very decent amount of miles in them! Hi theo! 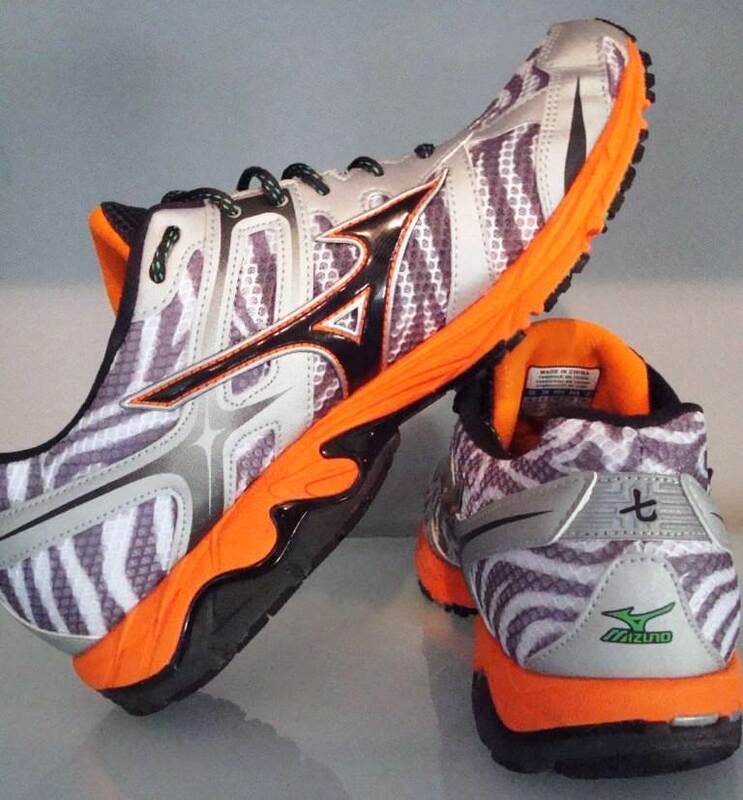 Have you tried the new mizuno wave sayonara? Which is better for fast transition shoes for overpronator? Sayonara or the elixir? Is there a difference between the Wave Inspire 7 and the Wave Elixir 7? I’m looking for a new pair of running shoes that can get me more on my forefoot. I’m a runner with flat feet and mildly over pronate. This past 3 months I’ve been using Brooks Ravenna 3 for my daily trainer and still looking to buy a lightweight performance shoes for my tempo run and race day shoes. I went to my local shoe store in Bandung, Indonesia, tried this Elixir 7 and go for a little run around the mall. I immediately fell in love! They feel very light and responsive. It runs a little large, though. I usually use size US 11/Europe 45 with other shoes, and I have to wear size US 10.5/Europe 44 with them. It doesn’t feel too narrow and the toe box is quite roomy, too! Sadly, I didn’t bought them because the price for these shoes is overwhelmingly expensive (around US$ 155), partly due to the increasing popularity of Mizuno shoes (and some other brands like Brooks & Saucony) in Indonesia. Someday when I can find a good bargain, I will definitely buy them. My name is Marco and I race Triathlons (sprints to Half IM till now, competing in a Full in March). I used to run in Brooks Ghost 4, and I started having problems during runs of more than 1h, I used to feel a pain on the upper part of my foot and then a stretching pain on my toe. I decide to buy a new pair of shoes and after all the tests I got told I needed to buy the ELIXIR….I Bought and I raced a half IM and an Olympic Tri in it and they felt great! No pain at all! Now is the time of the year when I need to put in more mileage and I was looking for a more protecting type of shoes..expecially since the fore part of my Elixir is starting to wear out and get compressed. MIZUNO INSPIRE? Or maybe NIRVANA? I was also looking at the ASICS BLUR 33, what do you think? Marco, I haven’t run in either of the Asics shoes you mention so I cannot comment on those. However, I think you should go with the Inspire or possibly just replace your worn out Elixirs with a new pair of Elixirs. You said you had no problems with the shoe and that’s always a good indicator of correct shoe choice. I also think that the Nirvana may be too supportive for you given the information you’ve stated. Good luck and thanks for reading! I’m a mild/moderate overpronator and have been using the Inspire 8s for the last couple months (worked really well) training up for a marathon in Feb 2013, and I’ve been considering getting a performance pair for speedwork/shorter races and the Elixirs seem to fit the bill nicely! I’ve been using Asics Tarthers for speedwork since last year but I’ve had enough as they’re slightly too big and offer little support which I need. The other option I may settle on are the Asics Gel-DS Trainer 17s which you review nicely. My only issue about the Elixirs is the large (15.1mm) heel-to-toe drop (only 11.5mm in the Inspires). I’m a heel striker so that’s not the issue but I’m more worried about it shortening my achilles over time potentially leading to achilles-related injuries. Maybe I shouldn’t worry too much – what’s your take on it? Anyway I need a speedy shoe with some support and its either gonna be the Elixirs or the DS Trainers! Lawrence, I’m not sure where you’ve gotten the info that the Elixir has a 15mm drop but that is not correct. If my memory serves, the Elixir has a 10mm drop. At any rate, it’s a fantastic shoe and so is the DS Trainer. You’ll have to decide for yourself by trying them both on. Good luck and thanks for reading. I currently own a couple of Elixir and I’m absolutely loving them. They couldn’t be better. Now I’m looking for a similar shoe (I want it to be Mizuno) and I think that perhaps the Wawe Inspire 8 could be good? I want a shoe that is lightweight, mild supporte for over pronator and suitable for heel strike. As close to the Elixir as possible, perhaps more suitable for longer distances. What do you think, is the Inspire a good choice? Excellent site btw. Lasse, if you are a fan of the Elixir then I can’t see any reason why you wouldn’t be happy with the Inspire for your longer runs. Thanks for reading! I’ve used the elixir and inspire as a great 1-2 combo over the past several years of marathon training. I’ll do my longer runs and easier paced runs in the inspires and use the elixirs for tempos and intervals. I also run in the mushas but mainly in 5k and 10k races and intervals. If the elixir fits you well, the inspire will be a good addition to your rotation. The inspires have held up well over the years – I’m about to retire a pair with 500+ miles. Good luck out there! I’ve run in wave riders and wave precision, sorry but the reviews of the new wave riders seem suspect, and precisions 12 are too ugly and did hold up the last ones I owned. I am a slight over pronator I’m looking at Elixir or Inspire. I run 15-20 miles a week. Ron, I’m not sure what you mean about the Rider reviews being suspect as it has been very well received. At any rate, the Elixir is a great shoe for the mild over pronator. I cannot use it every day because I need more support but if you only need a little guidance then you must try it on as it runs exceptionally well. Thanks for reading. Theo, I have spent the last few hours obsessed with reviews of new running shoes and am convinced to try some form of Mizunos. I am 37 yrs old, 5’7″, 145 lbs and about 2 or 3 yrs ago was told I needed stability shoes and was given NB 769’s. I like them but I am wondering if it is the shoe for me. I use my shoes both to train and race in marathons, and my goal time is 3:30. I would prefer a lightweight shoe. The wet foot test tells me I have a medium arch (closer to high than low), which to my understanding means I am a slightly underpronator and need a neutral shoe. The forefoot section of my shoes, however, are more worn toward the balls of my feet, which to my understanding may mean I need a motion controlled shoe. Yet the shoe prescribed to me at a running store were the NB 769’s – a stability shoe. I did the Mizuno http://www.myprecisionfit.com test (a pretty cool thing I must say), and they believe I am moderate netural and suggest the Mizuno Wave Precision 12. I live in Kauai where we have no running store to turn to for analysis. The wet test is only one portion of the process that determines which shoe you might feel best in. The Mizuno Precision Fit is pretty thorough and if it suggested the Precision, then that should definitely be on your list. However, I am going to guess that the Elixir would probably work just as well if not better. Again, I can only speculate since I have never seen you run or walk but I don’t think you’ll go wrong with the Elixir. You have a great site and provide great reviews. I have recently bought a pair of Wave Inspire 8 and I am loving them. Prior to that I had a pair of Brooks Infiniti 2 which were a dream. In between I had a very short stint in a pair of Nike Lunarglide 3, but they caused me plantar fasciitis almost instantly, I need more support than they give. Andrew, thanks for the compliments and thanks for reading. As to your question, I’m glad you’re liking the Inspire 8. I think it’s an excellent shoe that will work for a lot of over pronating runners. As for the Elixir, it is more torsionally stable and firmer than the LunarGlide and it should not let your foot sink in as much. Personally, I believe the LunarGlide to be much closer to a neutral shoe than a shoe for those of us with flexible arches. I cannot say with any certainty that the Elixir won’t cause you any plantar flare ups but I will say that it is definitely firmer and much less ‘mushy’ than the LunarGlide. If you do get the Elixir, I would recommend that you work it in slowly for some faster training days and road races. Best wishes. I think I am going to try these Elixirs, currently I run in the Inspire which I do like, alittle to firm though and also the Brooks Trance 10 which are comfy but heavy. I do have water in my knees and ankles problems do you think this would be a good shoe for me? I average 30-40 miles per week. Your current shoes(Inspire and Trance) are more supportive than the Elixir so I would advise you to use the Elixir for faster days or racing. If all goes well there then try using it on a daily basis. As always, try it on before you buy it. Thanks for the question. I’m an underpronator and this review states it’s best for overpronators. All of the descriptions seem to match what I need, but I don’t want to buy if it won’t work for me. I wear my shoes down on the outside, and my Saucony Omni 8’s work pretty well. They’re comfortable, but they tend to collapse a bit in the heel. My knees have both been “scoped” so the cushioned feel works best for me. Too firm and my knees start bothering me. Do you think these would work? Any other suggestions? Barry, if you are an under pronator then I must ask why are you in the Omni? That is a very supportive shoe and not one I would recommend for an under pronated gait. There are plenty of well cushioned neutral shoes available if your knees appreciate a high level of impact absorption. Please elaborate. Hi Theo, my question is very similar to what Jeremy asked earlier. The Elixir has been described as a good race shoe but does this cover all race distances or is it best suited to 10-15K races and speedwork? For me it is best suited as a 5K-1/2 marathon shoe but I need a lot of support from my footwear. If you have a more neutral gait then the sky is the limit! Do you think that the Elixir would be a good shoe to use even on my long runs-up to 20 miles, or would it be best for short/medium distances and speedwork? Depends on your support needs. If you need only mild support the Elixir should be fine for training. If you need more support I would advise you to use it as a distance racer or for your speedier workouts. Cheers! Would you say that they are durable enough to be worn as an everyday shoe for a midweight (9st female) runner, if the support is enough. Or are they likely to wear out very quickly? Alternatively if you know of manufacturers doing more minimal stability shoes and known for being roomy in the toe box, that advice would also be appreciated. OJ, it sounds like the Elixir would be a great fit for you. Go try them on! I am an over-pronator and have tried out multiple shoes, such as Brooks Adrenaline GTS, Mizuno Wave Alchemy, and Saucony ProGrid. I wanted to try out a lighter shoe, but one that still has stability/motion control features, so I bought these! They are much lighter than I am used to, and I am slightly worried that there is not enough arch support in the insoles… do you think that if I purchased a pair of shoe inserts with more support/arch support, I would be able to train in the Elixirs? My mileage is around 45 miles a week. That would probably work. If it were me, I would save the Elixir’s for racing or speed work and use the Inspire or Nirvana for daily training. After placing an insert in the Elixir it’s going to make the shoe as heavy or heavier than the Inspire and possibly the Nirvana. Thanks for the question! I’m a neutral runner with the left foot supinating a bit more than the right. I’ve been running in Mizuno WR 12, 13, and Ronin 3. Loved the WR12, and Ronin3 for their soft upper, overall fit and support. However, WR13 is too stiff, and (seems to) weight more. Heard the same thing about WR14. 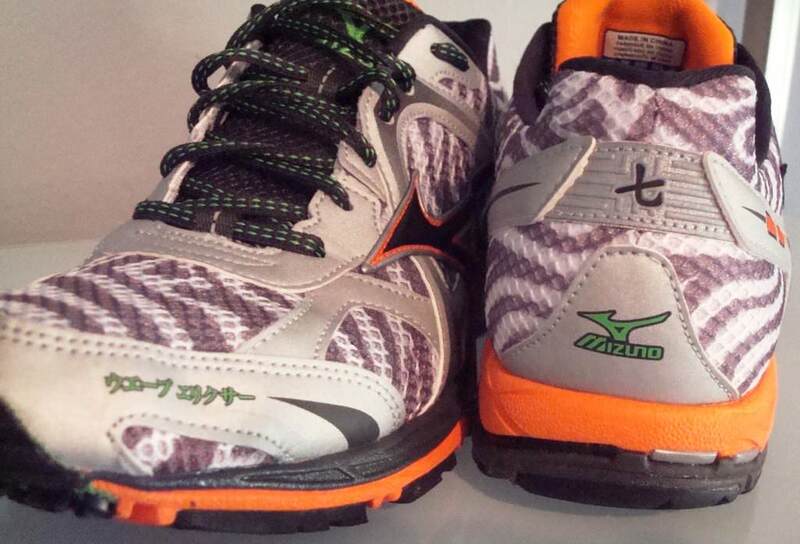 I’m looking for a Mizuno shoe with a bit more cushioning than Ronin3, and lighter than WR13. Do you think WE fits my need, in particular with my pronation style? Thanks in advance for answering. If you have an under pronated gait I would not recommend the Elixir for you. If you like Mizuno I would suggest that you look at the new Precision or Rider 15. Thanks for the question and we hope you enjoy the reviews. Thanks Theo for your quick reply. Have you run in Precision or WR15? If so, what are your impressions in term of their cushioning, and flexibility? Nowadays, I do my long runs 8-10M in WRonin3, which IMO are OK, but my feet hurt a bit thereafter. This makes me believe I need a more cushioned shoe. To what I’ve read, WR15 seems to be as stiff if not stiffer than WR13 because of the extended midsole plate. That seems to be a no-no to me. Ideally, I’d like to find something similar to WR12. Is Precision as flexible? Thanks. I’ve never worn Precision but I have seen pictures of the forefoot rolled-up into a ball, so yes, I’d say it definitely is flexible! I do not test neutral shoes as they are not the proper type of footwear for me. For most of us, shoes like the Ronin are best used for racing or fast workouts. You should probably try on the Rider and Precision but I’m betting you’ll like the Precision best. Good luck! I recently bought the new Elixir 7 and had been using the Inspire 7 prior. Besides the difference in weight, is there much else? I noticed my calves bothering (tighter) me a bit more after my first two runs of 8 and 5 miles in the Elixir. I have to say, I do love the way they feel and look. Rich, the main difference between the Inspire and Elixir is support and cushioning. The Elixir offers less of both but gains speed as a result. I find that the Elixir is best used for racing or fast workouts. If you need the support that the Inspire offers, then I would advise you to use the Elixir judiciously. Cheers! Just heard back from Mizuno, Manimal is correct! I called Mizuno USA located in Norcross, GA. The rep got in touch with the designers and according to rep, the Asian lettering on the outside of the toebox is Japanese for the model “Wave Elixir,” and the lettering on the back of the shoe translates to “7”….for the series number. Good to hear. I sent the question to my contact at Mizuno and I’m sure he’ll answer the same. Nice shootin’, Manimal! Hey Manimal (is it from the series??) thanks for checking this out! Im currently using Elixir 6 and have about 80 miles on them. I have noticed that the rubber/flex groove foam goes down really really quick in the fore foot. Not sure why, I have never seen this wear/tear before. Im not a fore foot striker at all…Would you think that the Elixir 7 would do the same, to me it looks like the flex groove is as exposed as on the Elixir 6. I dont expect my Elixir 6 to last more then 150 miles if the the rubber continues to go down as it does right now. I can’t say Stefan as I’ve never experienced that myself. That does sound unusual and I am at a loss to explain it. I too had the similar problem with my Elixir 6. Elixir 6 was my first “running shoes” while training for my first half marathon last fall. I had about close to 100 miles on them. After I finished my first half marathon, I noticed rubber/flex groove foam were just flat. I thought it was just me so I donate my shoes to Goodwill. I am tempting to give Elixir 7 a try. Btw, what’s the difference between Elixir 7 and Musha 3/4? I had the same problem with the Elixir 6 (haven’t tried 7 yet). I only got 150 miles on my second pair. I started reinforcing the bottom with Shoe Goo to prolong the life of the third pair. Would the Inspire be a more durable option with the same amount of control? BeBe, sorry I missed your question. 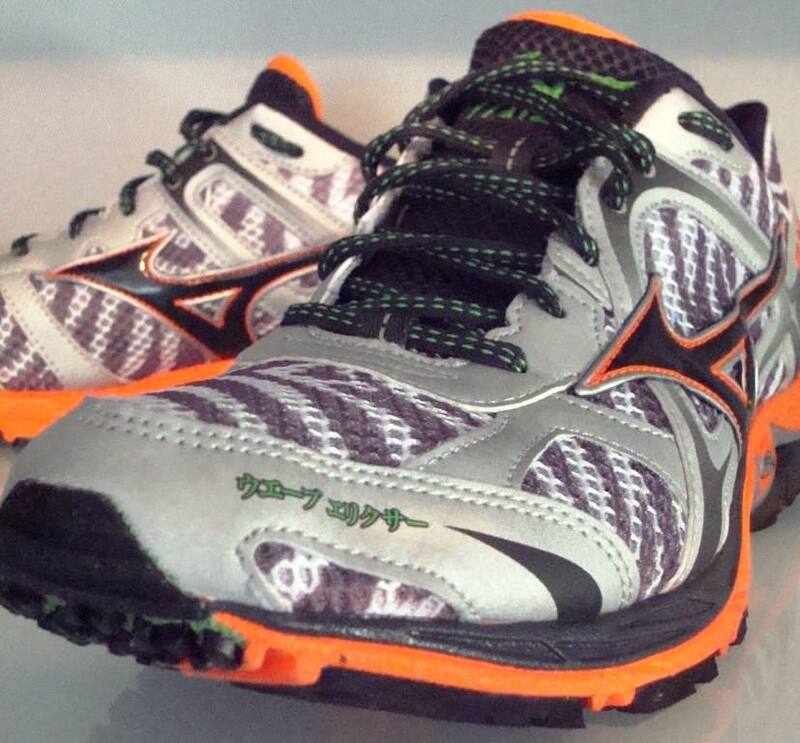 Sometimes they get by me but here’s your answer: the Inspire offers more cushioning and more control than the Elixir. I usually recommend that moderate over pronators use the Elixir as a speedwork or racing shoe but if your foot strike is closer to neutral then keep rolling with it! Josh, the main difference between the Musha and Elxir is support and cushioning. The Elixir provides more of both and weighs a bit more as a result. The Musha 4 also has a more curved last resulting in a more narrow midfoot fit. They are excellent companion shoes provided that they meet your need for support. Thanks for reading! Thanks for your response! I appreciate what this site has to offer. I am like any newbies out there searching for the perfect running shoes. Suffice to say, I have quite a few pairs in my rotation and begin to appreciate what each pair had to offer. 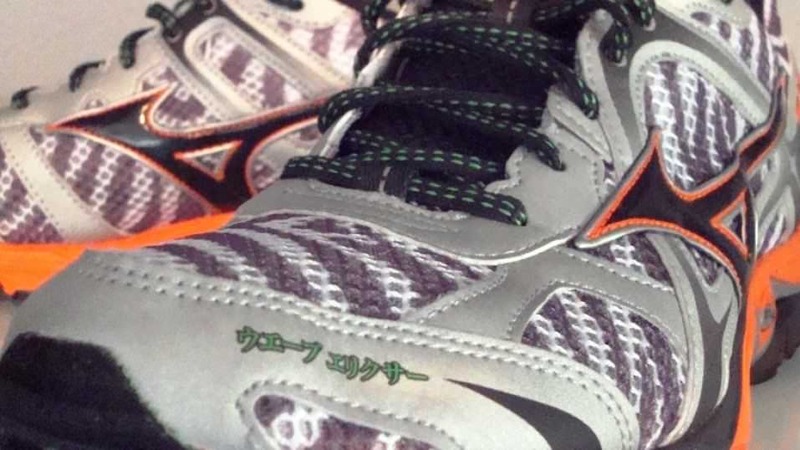 Quick Question… These shoes have something written on them in an Asian language(Japanese if I am not mistaken); Do you know what it says? I’m very interested in these and would be very bothered if I ran in these without knowing what the text means. Thanks! Good question Emi! Let me dig a little and see what I come up with. I can tell you this, you shouldn’t miss this shoe no matter what it says on the toe! ウェーブ = Wave エリクサー = Elixir. So, it says “Wave Elixir”! So no need to worry you were going to be running with something naughty written on your shoe! Also, the character on the back is a “7”. Great review. This shoe is in my radar. I’m looking for a show that can compliment my Newton Motions and this might be the shoe. However, my local running store has been out of them for a while. Hopefully they’ll have my size soon. I love these shoes. My go to shoe for the past year has been the Brooks Adrenaline 11. Tried the PureCadence. Like a lot, not love. Tried the Brooks ST5 Racer, Like more, not love. Tried these, love. I feel like I get the benefits of a more minimalist shoe (lightweight and fast feeling) with the comfort of a more traditional shoe. How is the forefoot cushioning in the shoe? Would a midfoot/forefoot striker find it too firm? It doesn’t need to be plush, but the forefoot in the Elixir 6 has very little cushioning to me. Hoping the 7 is improved! I’m a forefoot runner and really like the cushioning. I haven’t taken them on anything longer than 8, but my feet and joints feel great after I run in them. I’d say the forefoot is about on par with the Elixir 6.However, the Elixir 7 does use an Ortholite sockliner versus the old AP foam style so it is a bit softer. Mizuno will always provide a firmer ride than their competitors. Thanks for the question! How is the cushioning compared to Ds Trainer 16? Sorry Echetlos, but I have not tested the DS Trainer 16 so I really can’t compare the two.